They’re a perfect match: Johnnie is small and dark with rippling muscles; his dinghy is small and white with no outboard motor. 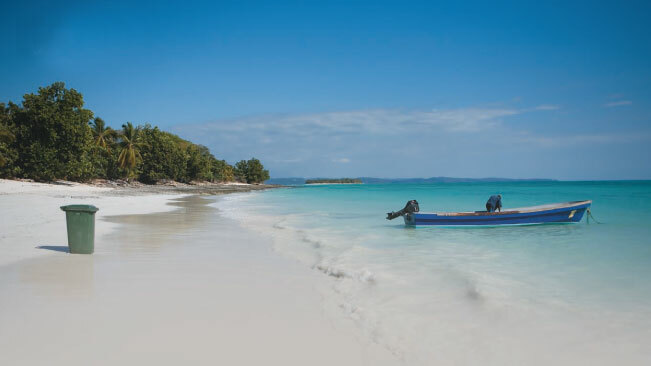 Each morning Johnnie ferries us—seven passengers and four crew—from our pristine beach camping spot back to the deck of the Salama Tsara, a ten-metre dhow that anchors in a succession of remote, palm-ringed Madagascan bays. Like Zanzibar and Timbuktu, Madagascar is one of those exotic travel destinations that has an unknown, almost mythical quality about it. In the weeks leading up to our departure from New Zealand, I notice how few Kiwis I speak to seem to know exactly where in the world it is, how to get there, or what we should expect on arrival. 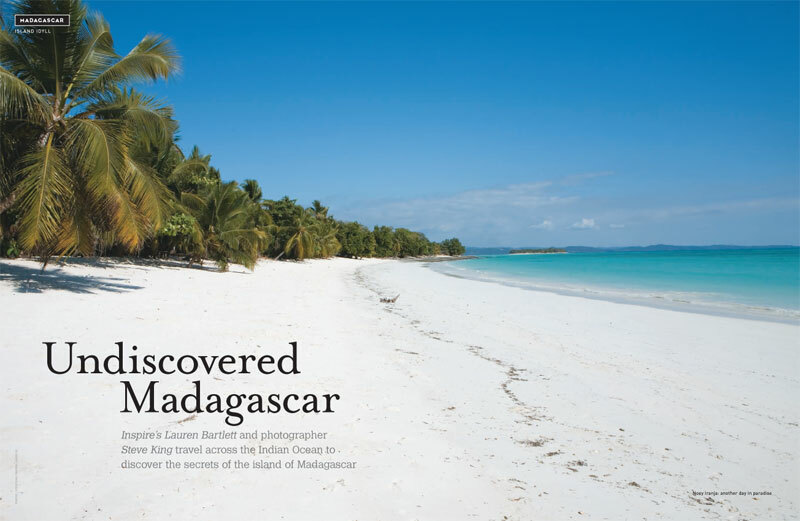 Now photographer Steve King and I, the first New Zealanders to experience tour company Kumuka’s week-long northern-region dhow safari, have ample opportunity to discover Madagascar’s best-kept secrets. 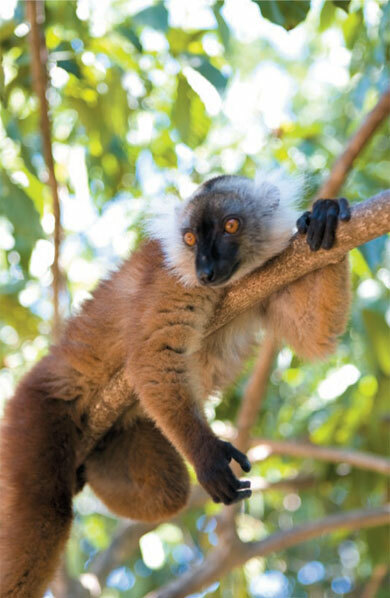 Madagascar is one of the world’s largest islands—almost the size of France—with a population of 18 million. Flung from the African continent into the Indian Ocean 165 million years ago, its early isolation has made it home to five percent of the world’s plant and animal species—more than 80 percent of which are unique to Madagascar and its surrounding islands. Colourful musical parrots, oxen-like zebu and curious lemurs are just some of the exotic creatures we encounter. There is desert in the south, rainforests in the east and dry deciduous forests along Madagascar’s western coast. The variation in landscape is striking—everything from bustling cities and arid highlands to lush, sparsely populated smaller islands. balancing bundles on their heads. Madagascar largely belongs to the native Malagasy people, descendants of Indo-Malaysian voyagers who staked their claim here 2,000 years ago. 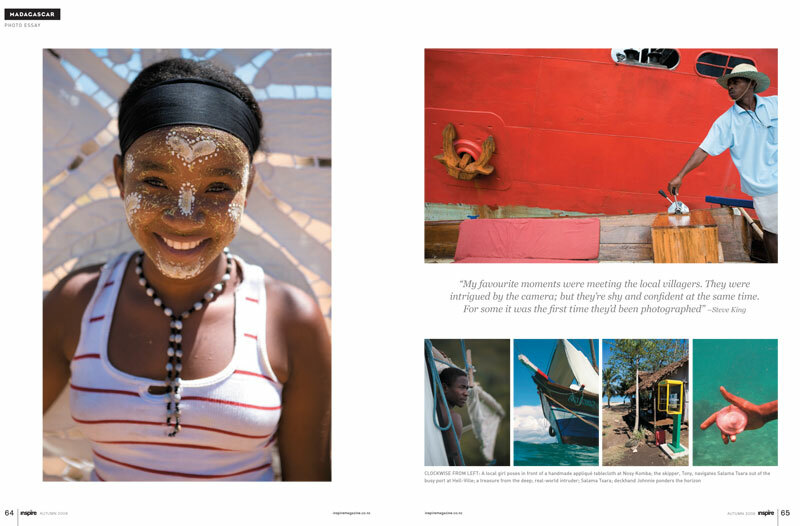 But in the millennia since, Madagascar has been exposed to many cultures and the diverse influences are evident in the Arabic traders, French bon vivants and ‘mainland’ Africans. 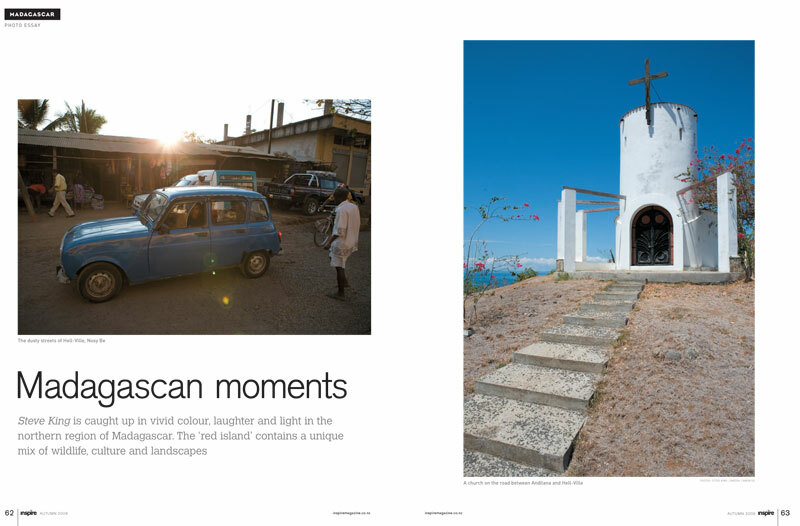 Nosy (Malagasy for island) Be’s crumbling Portuguese facades might be faded, but the air is fresh with the scent of nearby jacaranda and ylang ylang trees, and crimson vines of bougainvillea creep down to cover the roadside rubble. Ancient Citroen and Renault taxis, ochre with dust, drive bumper-to-bumper down the narrow streets. Crossing the street is a challenge: the correct traversing technique requires a Malagasy je ne sais quoi that takes time to master. Local stalls sell cotton sarongs, wooden carvings, fresh fruit and veggies, and the popular ‘Maki’ t-shirts—the local version of Billabong or Nike. At 3pm, the throng swells with children heading back to school after lunch. For a country where the average annual income is less than NZ$500, little poverty can be seen—at least in Nosy Be. All the children I meet are attending school, and most people can read and write in both Malagasy and French. Meandering down to the harbour, we find blue skies and fresh fish. I meet Jepo Balsells, a Spanish-Basque ex-pat who runs a local restaurant (Nandipo on Rue Albert I—the woodfired pizzas are to die for). Before immigrating to Nosy Be, he worked as a guide in Uganda, leading people through the highlands to see the gorillas. Why Nosy Be? “What’s not to love!” exclaims Jepo. “Blue skies every day, beautiful people. It’s paradise!” That, and the price of local beverages: in the lower end of town a supermarket sells bottles of rum for NZ$1.50— the accompanying mini-can of Pringles costs me $8. A cool breeze is blowing at the port and a tall, black man in a loose Arabic shirt greets us in a deep staccato voice and with a blinding white smile. It’s Mohammed, the owner of the two dhows that Kumuka uses for its tours. The more modern launch-style Salama Ojema is already full. Our boat, which we board eagerly, is Mohammed’s newest vessel—a one-year-old traditionally restored Arabic dhow. Mohammed has named it Salama Tsara (beautiful traveller) and it is certainly a looker. The sleek blue and red hull sits low in the water, the contrasting golden triangular sail furled tightly. On the bow of the boat is a sunken area filled with red cushions and shaded by a canvas cloth. It looks the perfect spot for lazing in the heat. On the salty deck, we meet our crewmates for the next week. There are eleven of us, including five other travellers. There’s a lone German woman named Gabi, and a family of four from Zambia—Samantha and Nested Smit with children Nested junior (7) and Christina (3). When I ask the Smits if they worried about bringing their family to a developing country, they tell me they consider it an educational experience. They want their children to see the Madagascan wildlife, and to spend some quality family time together. I can’t help but feel this would be a horizon-expanding experience for Kiwi kids too—closer than Europe and extraordinarily cheap once you arrive. And from meeting locals living in isolated villages to touching a lemur in its native environment, the trip is full of extraordinary moments. Our guide, Honare, outlines the plan for the week ahead. We’ll travel from Hell-Ville to a remote beach on mainland Madagascar, head to the sandy shores of Nosy Iranja and Nosy Kely in the Mozambique Channel, before boomeranging back to Nosy Be, stopping at the marine reserve, Nosy Tanikely, and finally camping on the shores of Lokobe National Park, where we’ll meet the lemurs of Nosy Komba. Leaving the port behind, we motor at about five knots through the clear turquoise water. I find a good resting spot on the port side of the deck in the shade of two kayaks. Within minutes, Christina and Nested have spotted dolphins nearby. They cruise with us for some minutes before heading off to deeper waters, while we pull into a sheltered island lee. 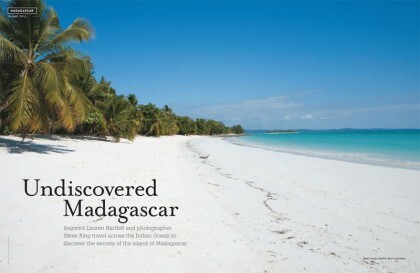 Madagascar is known as one of the world’s best snorkelling and dive spots. As soon as we’re in the 28 degree water I see why. We spot electric blue stingrays, pink cushion stars, clownfish and angelfish (“Nemo!” exclaims Christina). The visibility is astounding. A quick dry off on the deck and Saffy, our motherly cook for the week, serves lunch. There’s a delectable spread of seafood, freshly collected by the crew, and marinated by Saffy in local spices with garlic, lime and tomatoes. There is Malagache rice, golden with saffron, and home-made bread, similar to Indian naan. Pimente Malagache is an optional condiment. Made from hot peppers, garlic and ginger paste, it’s strong enough to blow your jandals off. Lunch finishes with juicy fresh pineapple and mango. We motor into Russian Bay, named after a group of Russian soldiers stationed here during the Russo-Japanese war, who spent their days getting sozzled on the local rum and shootingup the vegetation. When the war ended in 1905 (sans invaders), the soldiers opted to live out their days in the bay. Russian Bay is accessible only by sea. It’s coated with soft, caster-sugar white sand and sheltered by large palms. There are dolphins in the deep inlet, rounding up a school of fish for their supper. We can see the fish leaping out of the water in an attempt to escape. Those soldiers must have faced a tough choice—home to the bleak motherland, or staying in this tropical nirvana. It’s heaven too for Nested, a keen angler. Grabbing a rod, he takes one of the kayaks out into the seething mass of fish the dolphins have corralled. While the sun sinks, the crew raise our small tents and make our beds. A basin of fresh water sits on a woven mat outside each tent so we can climb between the sheets with sand-free feet. Johnnie has constructed a bathroom area with a solar shower and wooden stool. It is out of sight—sheltered by a piece of blue canvas hung between two palms—but still provides 180-degree views of the bay. The toilet is another matter. It’s a DIY affair involving a spade, a roll of loo paper and a plastic toilet seat on a fold-down metal frame. It’s a case of finding a secluded spot (all have panoramic views), digging a hole, then placing the toilet over the top. Perhaps not the most eco-friendly approach but it does ensure the best seat in the house! Our first evening, I’m feeling quite nervous about the fact that we are camping on the edge of Madagascan jungle. Honare and the crew reassure me there’s nothing that will eat me during the night. There’s a variety of harmless lemurs called aye-ayes, or bush babies, which are similar to possums. I can’t see them, but I can hear them snuffling in the trees. Close to midnight I wake up to nature’s call—thanks to a bottle of Madagascan-brewed Three Horse Beer drunk before bed. I cautiously leave the tent, toilet paper in hand. Returning to the tent, I’m startled by a scuttling noise. As I swing my glaring torch back and forth, the light reveals a land crab the size of a dinner plate. Several girly screams later, Steve emerges from the tent with a large stick. The crab fiercely brandishes its claws (as big as my hands) and, instead of retreating, starts climbing defiantly up the tent canvas. A few more shakes of the stick and it eventually slides off the tent and scampers back to its hole. At dawn the beach is calm and Johnnie is already in the dinghy, rowing our breakfast ashore. The midnight drama has almost been forgotten—the ony reminder is a few crab tracks in the sand. After coffee and fluffy, jam-filled baguettes, it’s back to the Salama Tsara to sail to our next destination. We drop anchor at Nosy Iranja—another slice of aquamarine paradise. A lazy turtle paddles slowly towards the deserted shoreline, while in a bucket on the stern lies a five-kilogram Spanish mackerel we hooked while coming into the bay. Once ashore, we venture through green palms towards the local village. About 200 people live here in huts made from palms and decorated with turquoise paint. It looks like something from a Just Juice ad: children playing soccer on a dusty lawn, men lazing under breadfruit trees and beautiful bronzed women picking pineapples. The village of Nosy Iranja is well established. There’s a large school building, deep well, local store, and even a movie theatre with palm-frond walls. “A lot of tourists leave donations, or pay a fee to the villages,” says Honare. Foreigners setting up resorts nearby also pay a local toll to the village. On the nearby island of Nosy Kely (joined to Nosy Iranja by a sandbar exposed at low tide) is Nosy Iranja Lodge, which provides the villagers with employment. Close by, the bones of a partially built Indian resort and a rusting Soviet bulldozer serve as reminders of what happens if you try to set up shop. Back at the campsite, Saffy prepares the fresh fish. She’s had the boys gut it and carve thin slits down its length. She stuffs the white flesh with fresh lime, garlic, soy sauce, mustard, and salt and pepper before grilling it slowly over the open fire. 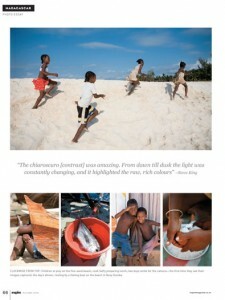 The smell is so tantalising that we soon all gather hungrily around the camp fire, Malagasy rum and cokes in hand. When two days later it’s time to leave Iranja, none of us want to go. We’ve hiked over the blood-red soil, explored a local lighthouse and spent time simply soaking in the bay’s intense natural beauty. Our consolation on leaving is that our next stop, Nosy Tanikely, is famed for its snorkelling. Better, we are assured, than Oz’s Great Barrier Reef. 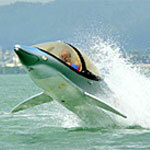 Indeed, at Nosy Tanikely we discover we may as well be in a glass bottom boat. The water is so clear I can see the individual spikes of the sea urchins on the sand seven metres below. Tanikely is a marine reserve and, leaping over the side to swim for the reef, I’m amazed at the friendly sea-life—I touch the rough shell of a turtle swimming less than half a metre away. Because of its reserve status, you can’t land on Tanikely without a permit, so we’re back to Nosy Be for the evening— this time in the nature reserve of Lokobe. From our camping spot we watch a tropical storm sweep in, then, minutes later, huddle under a palm-frond shelter until the deluge passes. By sunset perfect skies are restored. I’m glad my tent fly held up. After an early start we visit the lemurs of Nosy Komba. Komba is a large, craggy, jungle-clad island across the channel from Lokobe. One of the main advantages of the Kumuka trip is that we are up and in the reserve by 8:30am, well before the French and Italian tourists staying in resorts at Nosy Be can get there. We’re the first to spot the lemurs while they are still active. Honare worked as a nature guide in the national park for five years before joining the Salama Tsara, so he’s the local expert on lemur behaviour, full of fascinating facts about the furry, monkey-like creatures. Lemurs are prosimians, predecessors of modern apes and monkeys, and Madagascar is home to seventeen species of them—including the ring-tailed lemur, the expressive bunch made famous by the DreamWorks film Madagascar. We’re on the hunt for the cute and crafty black lemurs (Eulemur macaco) that populate Nosy Komba. As we scan the rainforest, a large lemur suddenly leaps from the overgrowth onto my back. After the initial shock, the sensation is quite pleasant—not unlike a cat balancing on my shoulder— although lemurs have fingernails rather than claws so there is no danger of a scratch. Honare hands me a small banana to feed to the lemur, while the rest of the family dangles from the trees, as curious about us as we are about them. Eventually, we tear ourselves (in my case literally) away from the adorable creatures and head back to the local village. There we browse the appliqué markets and buy Malagasy vanilla and ylang ylang oil, before downing cold pastis in a breezy beachfront tavern. Today is the last day on the tour for Gabi and the Smits— they have early flights to catch from Nosy Be the next morning. Because the Kumuka tours are so small, they allow for some flexibility. So, once the goodbyes have been said, Steve and I decide that, instead of spending another night at Lokobe, we’ll take the crew of Salama Tsara out for a night on the town, to say thanks for a great tour. After a last meal on the beach, it’s back on deck, rums in hand, Malagasy music pumping, to sail through the sunset back to Hell-Ville. I wake the next morning to a gentle breeze on my face and pounding in my head. After several beverages in a bar where the seats were upturned beer crates and crazy local music blasted from a tape deck, I’d decided the foredeck was the best place to sleep. The port is starting to stir in the pre-dawn light. Fishermen are lowering their small dhows into the harbour, and taxis are pulling up on the wharf. Below deck, Saffy is making us a final cup of strong Malagasy coffee and Johnnie is preparing the little white dinghy to row us ashore for the last time. Surely it’s only au revoir—a paradise such as this is going to be impossible to stay away from.